Both powerful and affordable, the Kawasaki 24 HP (726cc) engine and the heavy-duty commercial-grade welded steel frame, combined with the Hydro Gear 3100 transmission and Ogura clutch, will have you finished with your yard in a fraction of the time. Sail across the landscape at 8 MPH in both forward and reverse. Achieve a beautiful and professional cut with the robust 11-gauge fabricated cutting deck and the commercial-grade cast iron blade spindles with three G6 Gator mulching blades. The mower deck adjusts effortlessly to height ranges of 1.5-4.5 with the foot-assisted deck lift. Swishers patented Rapid Response Control System gives you superior control and comfort, while the fluid 360 turns and low center of gravity offer ultimate manoeuvrability. The steel floor pan, adjustable high-back suspension seat, full-engine wrap, composite fenders with integrated storage, battery compartment, cup holder, hour meter, 12V adapter, 8 gallon fuel capacity, and a front and rear hitch. Easily convert 12" string trimmers to mowers. Ideal for smaller yards or areas difficult to mow with conventional mowers. 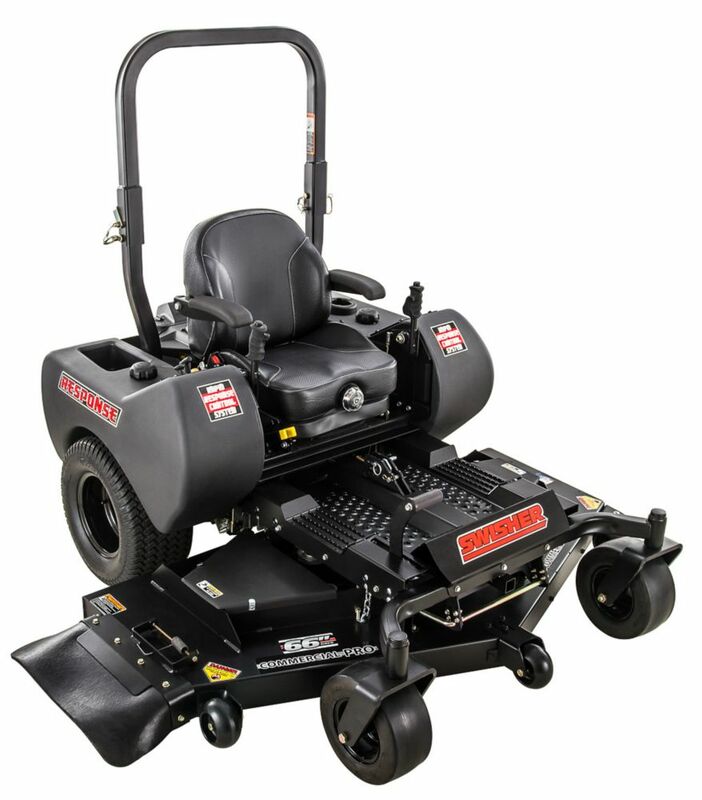 Compatible with NST2118, LST220, LST300, LST400, providing many options to convert from trimmer/edger to mower. Includes (1) MTD100 detachable mover deck. String trimmer is not included. Keep your lawn tractor performing at its peak with the John Deere Briggs and Stratton 17 HP Engine Air Filter/Pre-filter for John Deere Lawn Tractors. John Deere incorporates more filtering media paper than most non-original equipment filters which prevents harmful debris from entering the air intake system. John Deere tested for durability and safety. Long-Lasting, Durable and a Comfortable Seat. The John Deere E160 riding lawn tractor with a wide 48 deck and 24 HP V-Twin ELS (extended life series) engine features an advanced filtration system for enhanced performance and long engine life. Other features include The ReadyStart starting system for choke-free, car-like starts, a hydrostatic transmission with cruise control to set your own pace with speeds up to 5. 5 mph. And so much more. The new, redesigned operators station is comfortable. The adjustable high back seat with lumbar support and deluxe steering wheel is a wow. The new side-by-side, forward and reverse, 2-pedal foot controls are easy and the electric blade engagement is low effort and simple. But how good is the cut? The 48 in. Edge mower deck is time-tested and proven to offer superior cut quality and can be easily equipped to bag or mulch. Commercial Pro 66-inch 24 HP Zero Turn Riding Mower with Kawasaki Power Both powerful and affordable, the Kawasaki 24 HP (726cc) engine and the heavy-duty commercial-grade welded steel frame, combined with the Hydro Gear 3100 transmission and Ogura clutch, will have you finished with your yard in a fraction of the time. Sail across the landscape at 8 MPH in both forward and reverse. Achieve a beautiful and professional cut with the robust 11-gauge fabricated cutting deck and the commercial-grade cast iron blade spindles with three G6 Gator mulching blades. The mower deck adjusts effortlessly to height ranges of 1.5-4.5 with the foot-assisted deck lift. Swishers patented Rapid Response Control System gives you superior control and comfort, while the fluid 360 turns and low center of gravity offer ultimate manoeuvrability. The steel floor pan, adjustable high-back suspension seat, full-engine wrap, composite fenders with integrated storage, battery compartment, cup holder, hour meter, 12V adapter, 8 gallon fuel capacity, and a front and rear hitch.